Based on current volume ice loss trends, I predict with 97% confidence the Arctic will be ice-free on July 29, 2021 at 11:42 AM. Ice loss this year was fourth lowest on record, with all of the lowest four years occurring since 2013. 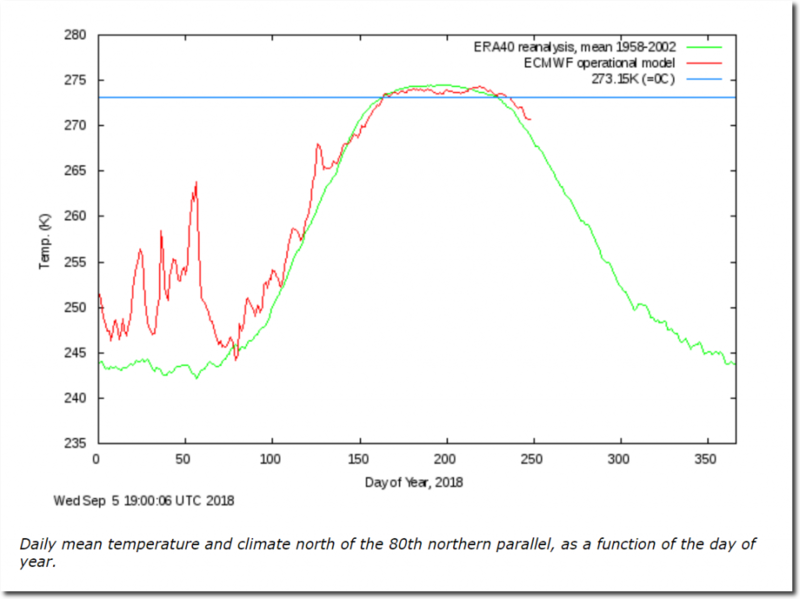 This shouldn’t surprise anyone, because summers have been running cold in the Arctic in recent years. The ice edge is not quite as extensive as it was in 1971, when the New York Times was worried about expanding ice and a new ice age. The climate prophets aren’t doing very well, which is why the fake news press quotes them every day, and refuses to talk to anyone who states factual information about climate. 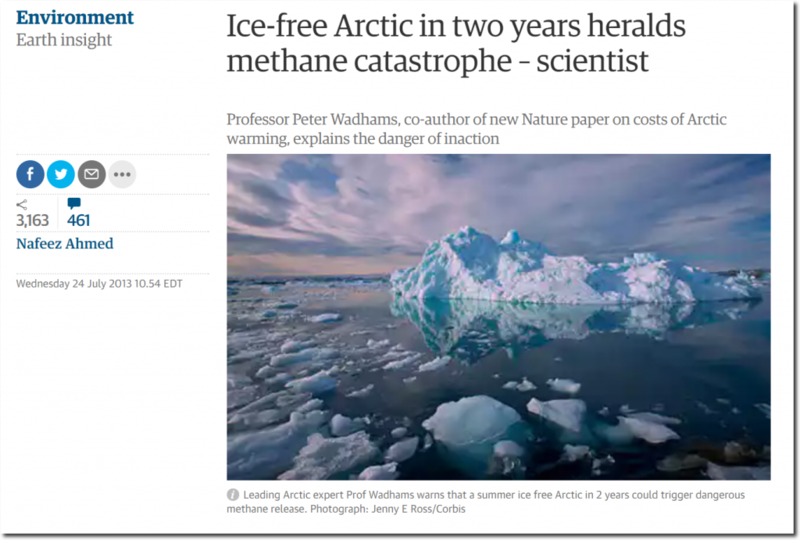 The story is-less ice cover will warm the water and give us an accelerating heating and ice loss. 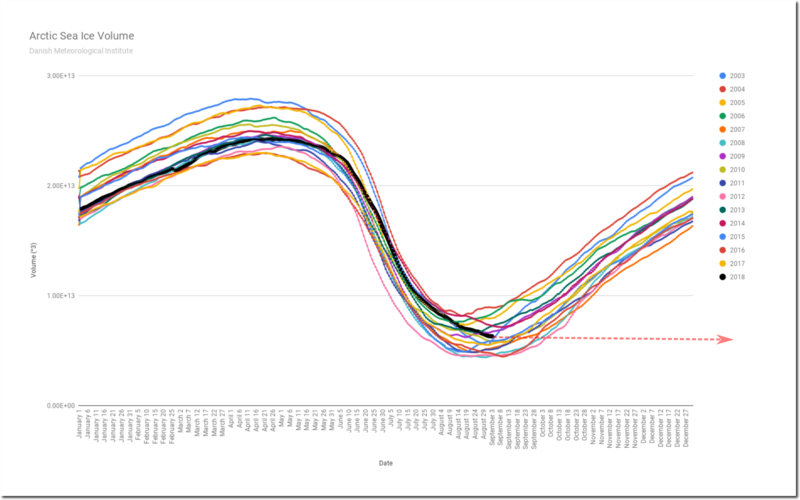 This is due to less albedo in the ice free waters. One of the tipping points mentioned. Can we say this is proven to be wrong? So where is the acceleration mentioned? 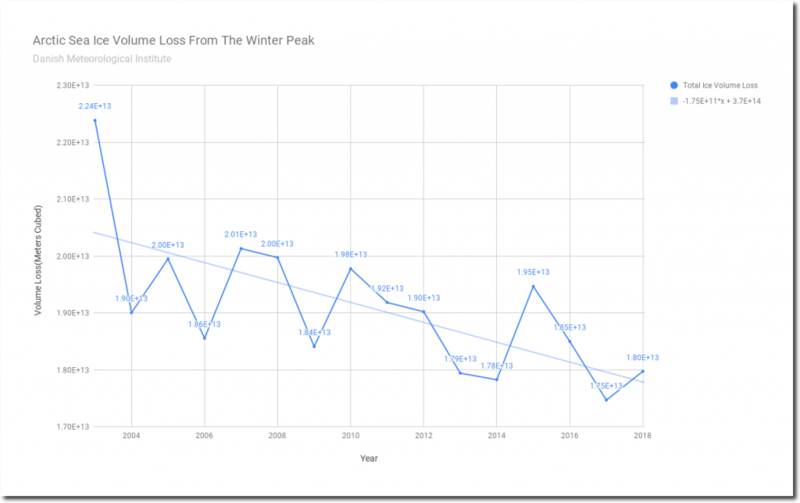 The point of this post is that the ice cover is not trending downward over the last 15 years or so. “Can we say this is proven to be wrong?” – I’d say the standard for asserting a ‘tipping point’ would be to prove that it is correct, not to throw it out there and assert that someone must prove it incorrect. Can that be proven wrong? I might have mistaken this audience knowledge of the different theories for tipping points. The “may have” in the article’s title tends to weaken your argument. 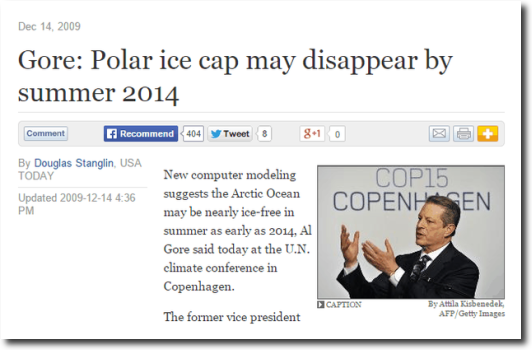 Please elucidate the conditions for the “tipping point” and when that threshold has been reached or will be reached. If there are multiple tipping point scenarios, then by definition, at most only one of them can be correct. Which theory in particular do you support? And please provide proof that all of the other tipping point theories/scenarios are incorrect. And before you judge the knowledge of anyone on this site, please know that I’m an electrical engineer, so I almost certainly know more about positive and negative feedbacks than you do. On a practical basis. Yet another instance of the boy who called wolf. On occasions you have provided a website which shows sea level rise and fall on the margins of North America. Can you please post the link for that website? It would much appreciated. to save us from the ice age. Sadly the skills were so strong that we all gonna burn now if we do not pay the co2 jiyza. Is this 97% confidence the same as “for the record”? I love that moronic pose of Gore staring at his hands. We should all give thanks every day for those hanging chads in Florida. A little OT, but we had 4″ of ‘Permanent Drought’ at my house today in Metro DFW, from 5-6:20 pm, as measured in my garden rain gauge. Still raining, and more expected by Sunday morning.